Public transportation (or sometimes the lack of it) is a huge part of traveling through Central America. Unless you are wiling to spend the extra money for private transport throughout your trip at one point in time you will find yourself cursing all things with motors for some reasonâ€¦. But, as the saying goes, â€œGetting there is half the adventureâ€ and, as I found out earlier this week, sometimes it is the whole adventure. Iâ€™ve spent this entire week on the island of Ometepe in Lake Nicaragua. Ometepe is an island created by the formation of two volcanoes with an area of land connecting the two â€œsidesâ€ of the island. On the satellite photo above (thanks google!) you can see the south side, which is the smaller side, of the island and where Iâ€™ve spent most of my time. 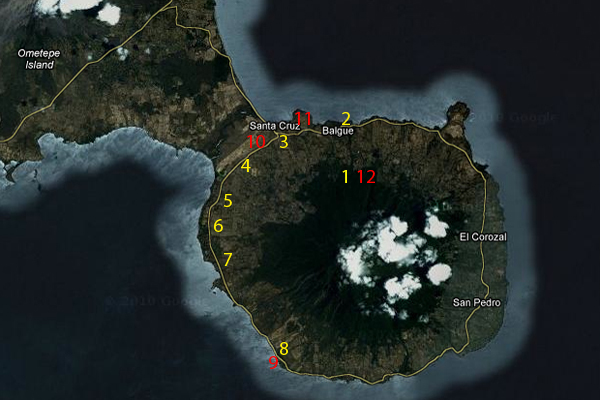 Before I take you along for a seven hour adventure on Ometepe, let me give a couple pieces of info. First off, just for a reference, the distance from #2 to #3 on the map is roughly three kilometers. Second, the few buses that are scheduled around the south side of the island are scheduled based upon the needs of workers on the island, not tourists (as it should be, but not something that helped me on this particular day). So, now that that is out of the way, let me take you along for the adventure of â€œAlmost Getting Thereâ€¦â€ starring myself and my French friend Barnabe. #1 â€“ 10:15am â€“ We were staying in a place called Finca Magdelena. It was basically a glorified organic farm that rented out tons of rooms for $3 a night and gave its guests I killer view across the island and Lake Nicaragua. Our plan for this day was to go to the other side of the south portion of the island and visit a waterfall we had heard about. The first buses headed that way were at 5am and 7am, and it only took a few beers the night before to convince us we wouldnâ€™t be making either of those. Instead we opted to catch the 11am bus to Santa Cruz (#3) where we would hopefully find a connection bus to our final destination. We began the hike from Finca Magdelena (which is posted on the sign as one kilometer but is easily close to two) to the main road to find our bus. #2 â€“ 10:45am â€“ After about 30 minutes of walking we arrived at the bottom of the hill on the main road that circumnavigates the south portion of Ometepe. Luckily we had left a little early as the bus was already pulling out and heading towards its destination on the north side of the island. For the record, this is probably the first early bus I have ever seen in Central America. We hoped on, paid our fee, and even were told good news that there will â€œprobablyâ€ be a bus headed around the other side of the south portion of Ometepe towards our waterfall. #3 â€“ 11:15am â€“ As usual probably ended up being probably not. We pulled up to Santa Cruz (#3) and caught a glimpse of our bus pulling away. Our driver started slamming on his horn trying to get the other drivers attention, but to no avail. Barnabe and I got out of the bus a little pissed off and wondering why the other bus hadnâ€™t waited in Santa Cruz for a minute or two longer. You would think that a bus driver would know the bus schedule and might consider waiting for an incoming bus in the hopes of a few people wanting to transfer, but apparently not. After walking for about 15 minutes we see a group of kids standing on the side of the road. This meant one of two things. They were either waiting for another bus we didnâ€™t know about, or they had JUST gotten off the bus. We ran up to them to ask them. They had just been dropped off. â€œOk, we asked, well when is the next bus towards the waterfall?â€ Four oâ€™clock, the oldest looking boy replied. The look on our faces as our hears sank must have been deliriously funny as the entire group of children exploded with laughter as we slowly realized we would be walking/hitchhiking the rest of the way. That is, unless we could catch the bus. #4 â€“ 11:30am â€“ We had started speed walking and low and behold as we reached the top of a hill we spotted the bus four or five hundred meters in front of us slowly crawling up a hill. That just goes to show you how slow this road was and how many stops the bus was making if two guys were able to almost catch up to a bus by speed walking. We launched into a full sprint and people living near the road literally came out of their houses to watch us try and catch the bus. We ran up and down hill for close to a kilometer trying to catch this thing, but each time we got within three hundred meters or less, it would reach a flat area or a downhill area and then speed off again into the distance. This charade probably took place for about 30 minutes before we eventually gave up and watched the bus fade into the distance. Our efforts were rewarded though; at about 12:15pm a German couple came around the corner in their SUV and picked up two very sweaty, dirty, and exhausted hitchhikersâ€¦. #5 â€“ 12:25pm â€“ The Germans could only take us a short distance. They said they would eventually reach where we wanted to go, but they had five or six stops to make on the way there and we would probably be better off trying to catch something else. We agreed, and they said if they saw us later theyâ€™d pick us up again. Plus, we were in a small town, so we assumed we had already made it to the town of Merida, which we were told was not far from our waterfalls. #6 â€“ 12:35pm â€“As we slowly walked through the town we thought was Merida we flagged down a truck and asked if they were heading to San Ramon (the town closest to the waterfall). The driver said no, only Merida. Wait what? Merida? Arenâ€™t we in Merida? We quickly realized we, in fact, werenâ€™t in Meridaâ€¦ We were about 30 minutes away walkingâ€¦ Luckily we didnâ€™t have to walk, and the guy gave us a lift to the actual town of Merida (#7). #7 â€“ 12: 45pm â€“ Once in Merida we asked around and the consensus seemed to be that we could get to San Ramon in about 30 minutes walking. We used the super effective equation of simply doubling whatever anyone tells you for the time it takes to get somewhere and assumed we would arrive in about an hour if we were walking the whole way (which we ended up doing). #8 â€“ 1:50pm â€“ One hour and five minutesâ€¦ Our equation worked almost perfectly! Which was great for nothing and bad for our schedule. Once we had arrived at San Ramon we found the entrance to the waterfall. We knew the hike to and from the fall would take about three hours with a short swim, but what we didnâ€™t know was that the last bus headed back to our side of the island was at three oâ€™clockâ€¦ â€œYou have got to be kidding meâ€¦â€ I muttered. There was no way we could go to the waterfall because then we would be relying on hitchhiking (which isnâ€™t that reliable) or we would end up walking back in the dark (also not a great option). Then the guy at the gate says, â€œIâ€™ve got a friend who might be able to helpâ€¦â€ We both knew where this was going but decided to at least hear what the guy had to offer. We were told we could hire a private taxi (aka sit in the bed of a pick up truck) for $25 to $30 U.S. Since this was easily over half of a days budget for Barnabe and I, we politely declined and accepted defeat, there would be no waterfall today. We headed further up the road to grab some food, go for a swim, and enjoy one of the best Fantas I have ever had in my life. It turned out to be quite a relaxing meal and we both decided the â€œfunâ€ of the day was worth the trip, even if we didnâ€™t see the waterfall. #9 â€“ 3:15pm â€“ As three oâ€™clock rolled around we dried off, paid our bill, and walked to the road actually feeling somewhat accomplished. We hoped on the bus and settled in for the slow ride home. Soon though, we realized one flaw in our planning for our trip home. At Santa Cruz (#3) this bus wasnâ€™t going to turn right towards our hostel, it was going to keep going to the north side of the islandâ€¦ Awesomeâ€¦ After all of this we might end up walking close to 5 more kilometers home. #10 â€“ 4:30pm â€“ We reached Santa Cruz; the spot of our first missed bus, and now the spot of no more bus. Even worse, it looked as if most of the locals were taking to the road and walking. This pretty much guaranteed there wasnâ€™t going to be any other sort of bus, truck, horse, or giant pig pulling a cart (this doesnâ€™t actually happen, just saying). We would be walking and hoping and prayer for a vehicle with room for two to swing by and save us! #11 â€“ 5:00pm â€“ We must have looked pretty gross as the first few cars drove by us one after the other. This was actually the first time I was ever not picked up while trying to hitchhike in Central America. Iâ€™ll just pretend it was Baranbeâ€™s fault for looking so French. Finally though, a group of spring breakers from Georgetown University asked their driver to pull over and pick us up. The bus was all girls and one guy, and the minute they asked where we were from and when Barnabe replied â€œFranceâ€ I think their spring break truly began. I was the American along for the ride, and I was completely ok with that. #12 â€“ 5:20pm â€“ Twenty minutes later we arrived back at Finca Magdelena. We told our friends who had stayed behind of our adventures for the day, and decided to celebrate a successful day, even though we didnâ€™t reach our original goal. We took all of the money we would have spent on entry to the waterfall (about $3 each) and bought plenty of beer for the evening. Not a bad ending to a memorable day. yea we were both pretty spent by the end of the day. I think we went to bed before 10, haha. Racing the bus! Hilarious, But best of all is that you took this adventure in the best possible spirit and celebrated the journey rather than the waterfall. After all, you can see a waterfall in many places but a bus ride like this is unique. Sometimes you just have to take what you’re given! I enjoyed every second of this post. I think some of Kent and I’s best memories are of days very similar to this. Thanks a lot! It is a reoccurring theme for me as well. We adored Ometepe, but wow transportation was a pain! We ended up walking back to our lodge on the south part of the island from ojos de agua. Three hours and not a single truck/car/bus. It was a hot walk, but I’ll never forget how good the beer tasted at the end. hmmm…..
You’re mad!! I needed a beer after just reading your article!!!! Safe travels! Ometepe was one of my highlights in Nicaragua. The island was so safe we just hitchhiked to get around it.